Finally succumbed to fresh strawberries from the greenhouses at Denison Farms at the Corvallis Wednesday Market. They’re still tart due to lack of sun but more vivid than the still-good organic clamshell Driscolls from California I caved for at the welcome oasis of Metropolitan Market while camped out at Seattle Children’s Hospital last week. My uncovered berries in the garden are just flowers that haven’t yet produced, though I did pick a few samples from nearby test plots on OSU’s campus. The strawberries and some neglected spinach inspired an impromptu lunch today. 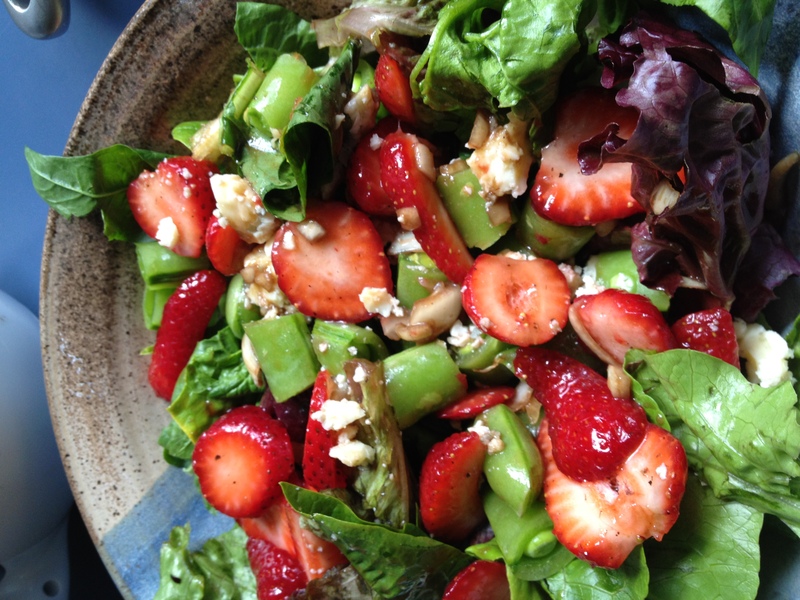 I macerated the strawberries (with a touch of sugar) in balsamic and black pepper, chopped up some sweet sugar snap peas (also from Denison’s), crumbled some Rogue Oregon Blue on top and dressed the greens with a balsamic-honey-shallot-Dijon-olive oil vinaigrette. All it lacked was some toasted hazelnuts for crunch. Here’s to strawberry season! I can’t wait to take Theo back to pick strawberries at organic Fairfield Farm near Southtown. Looks so delicious, Laura – Wish I could have come for lunch!